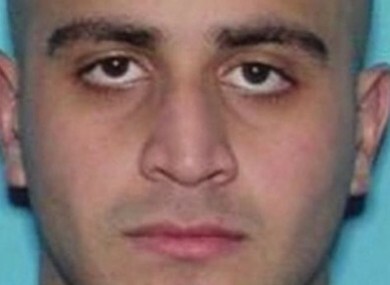 ORLANDO GUNMAN OMAR Mateen acted with “chilling calm” in phone calls made at the height of the deadliest mass shooting in US history, styling himself an “Islamic soldier” and warning of more bloodshed to come, officials said today. US authorities released partial transcripts of Mateen’s conversations with emergency services and police negotiators during the June 12 attack on a gay nightclub that left 49 people dead. “I’m in Orlando and I did the shootings,” the 29-year-old said in a 911 call at 2:35am, half an hour into the three-hour siege at the Pulse nightclub. While officials have stated that Mateen pledged allegiance to the Islamic State group and its leader Abu Bakr al-Baghdadi, the transcripts were redacted to mask those details. I pledge allegiance to (omitted) may God protect him (in Arabic), on behalf of (omitted). The FBI also released details of three conversations between Mateen and police crisis negotiators, between 2:48am and 3:24am. In these calls, the FBI said, the shooter identified himself as an “Islamic soldier”, repeated his pledge of allegiance, and told the negotiator to tell America to stop bombing Syria and Iraq. “While the killer made these murderous statements he did so in a chilling, calm, and deliberate manner,” FBI special agent Ron Hopper told a news conference in Orlando. At 4:29 am, 30 minutes before a SWAT team decided to storm the club – shooting Mateen dead – victims evacuated from the club told police the gunman was threatening to put four explosive vests on hostages within 15 minutes. “But here is what I will tell you,” he added. Those killings are on the suspect and on the suspect alone in my mind. Email “"I did the shootings": Transcripts show Orlando gunman acted with 'chilling calm'”. Feedback on “"I did the shootings": Transcripts show Orlando gunman acted with 'chilling calm'”.